It was June 15, 2017. After work, I dropped by the Roastery, as I have done a hundred times. I sat down at the Experience Bar, where Anton was on bar. We made small talk. As I sat drinking a Strawberry Spritzer, other customers came and went. A young customer came up behind me, and sat a mug on the counter, showing it off to the partners working at the Experience Bar. This little mug had the words “Opportunity to be a partner” on it, which I recognized as being a partner-only coffee mug. I started talking to the young guy. “Hey, I like your mug!” That turned into a LONG conversation with him. At first I thought he must be a partner, but no he is a customer, but he’s a huge a fan. 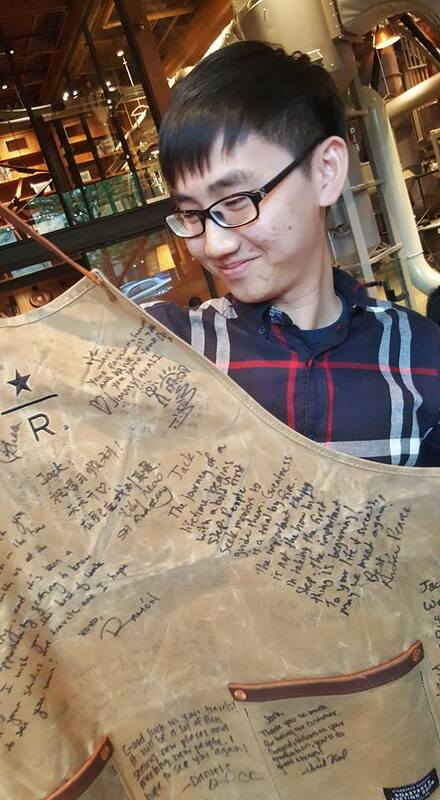 As it turns out, Jack is a Starbucks China customer who spent the last year in Seattle living very close to the Roastery. We are both regulars! He laughed and said, (as I have noticed many times) there aren’t really that many regulars at the Roastery because so many guests are tourists. He told me which building he lived in, and I was surprised I hadn’t run into him before! Like me, he lives very close to the Roastery. What a sweet thing. Let me explain this to you: He had lived in Seattle for one year and was leaving the next day to go back to China. 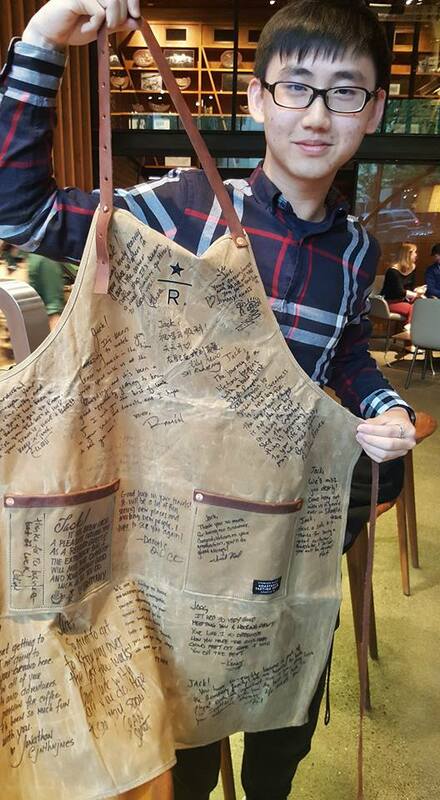 The Roastery partners gave him an apron signed by a lot of the store partners. The Roastery has a few partners working there from China, beginning training for the opening of the future Shanghai Roastery location. This epitomizes Third Place. Jack is a customer and the Roastery was his Third Place and he connected with the Roastery partners. When you hear people talking about the Starbucks Experience, this is it. 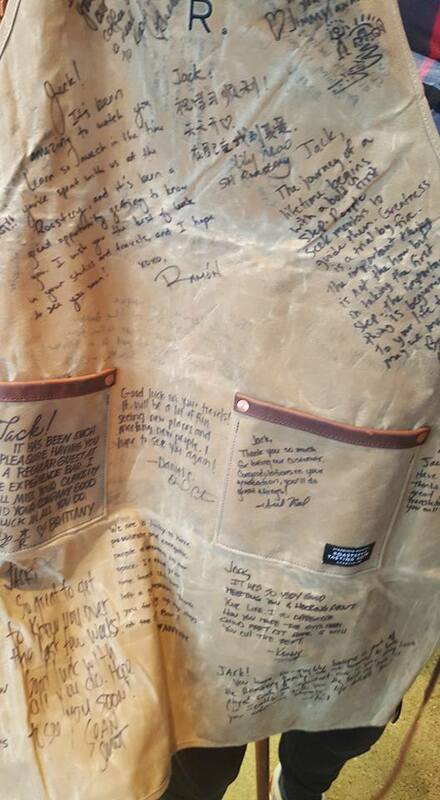 Jack, it was a privilege to meet you at the very end of your year in Seattle! Thank you for the Starbucks passion you have and demonstrating the Starbucks Experience in action! Whiskey Barrel-Aged Sulawesi Now at the Roastery. Starbucks Roastery Tees & Sweatshirts: Knocking it out of the park with Palmer Cash. I adored this story, how great you were there at the right time to chat with him. 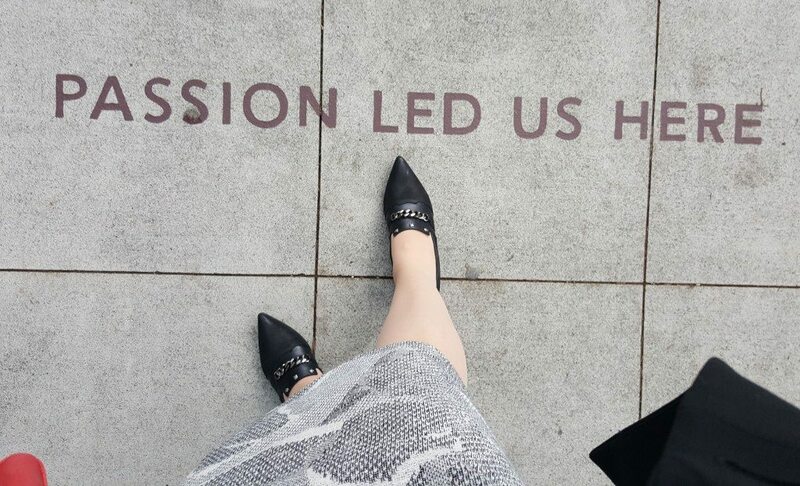 I love the Passion Led Us Here on the pavement, obviously. This is the epitome of the Starbucks experience!